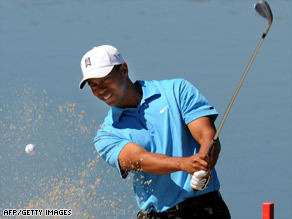 Tiger Woods’ return to competitive golf got a strong boost Wednesday with his win over Australian outsider Brendan Jones in the first round of the WGC-Accenture Match Play Championship in Arizona. The match ended on the 16th hole with Woods up by 3, a lead Jones could not overcome in the final two holes at the Ritz-Carlton Golf Club. Woods next takes on South Africa’s Tim Clark, who beat compatriot Retief Goosen.